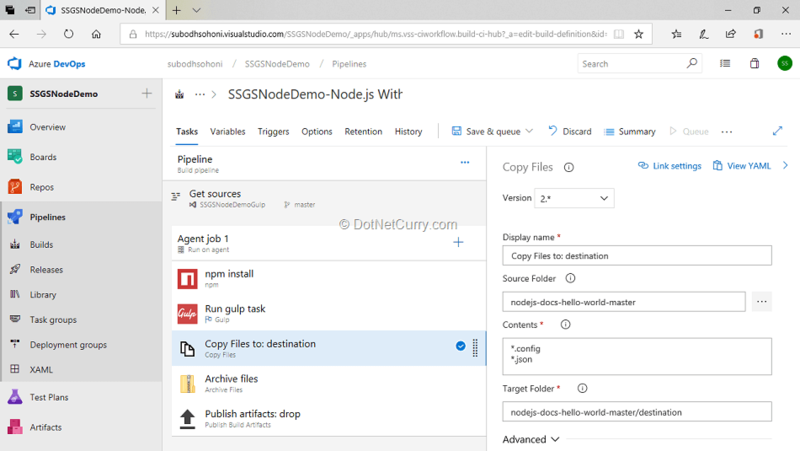 Abstract: Using Azure DevOps to perform the build of a NodeJS app and deploy it to Azure App Service as a web app. 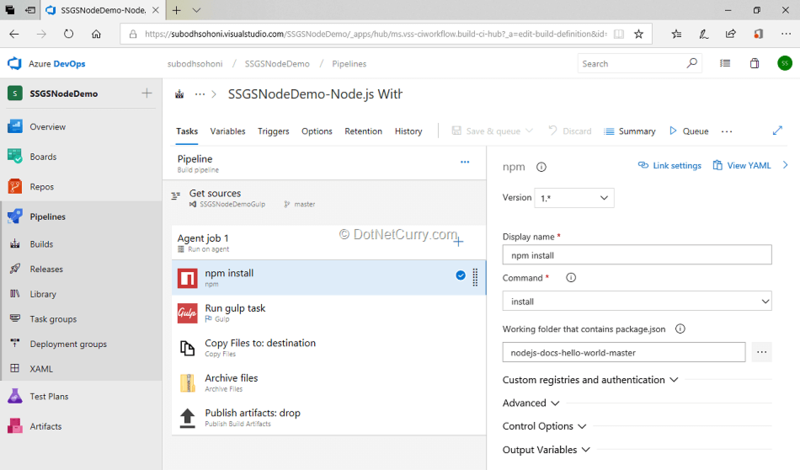 In a previous article in this series, we walked through the build and deployment of a NodeJS application on Azure App Service. 3. Deploy that archived package on Azure App Service. Let us first understand why to use Gulp. Gulp is one of them. Gulp allows us to create a set of tasks which are based upon the node modules that I mentioned earlier. It then allows us to execute those tasks as part of an automation script in a specific order or in parallel. Grunt is another popular tool that also runs a task engine. The benefit of Gulp over Grunt is that Gulp does not store output of a module execution to a physical file, but rather stores it in a memory stream. If there are multiple modules to be executed on a set of input files, Grunt will be slower than Gulp, because it has to write a lot more on file. 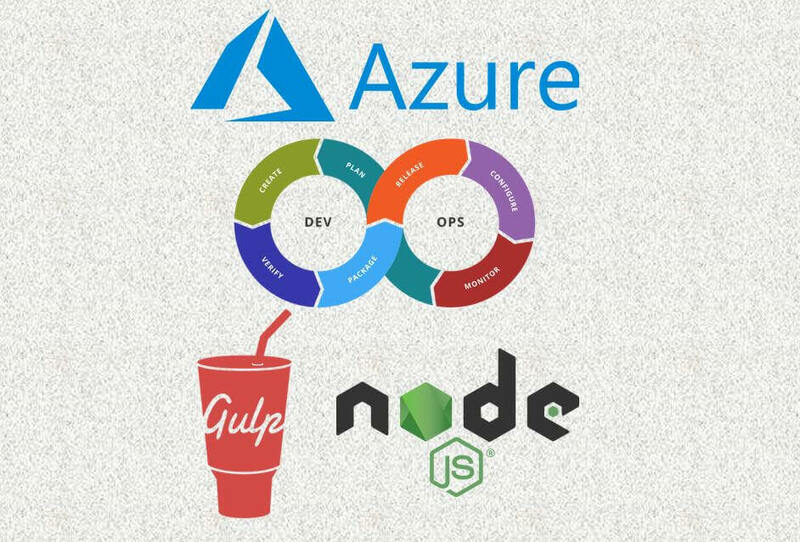 Another aspect to consider is Why should I use Gulp with Azure DevOps?. Gulp is sufficient to build a NodeJS project on its own, but the build which we execute on the command prompt assumes that we have the latest code with us. This assumption is valid when we are developing a trivial project, but when we are developing a non-trivial product in a team, this may not always hold true. We may also want to set automation of trigger for everyone in the team. Setting up such an automation on each team members machine may be tedious and time consuming. Instead of all this, we can create a build pipeline on Azure DevOps and set the Continuous Integration trigger. We may also extend it to deploy the output of the build to Azure App Service by using Release Management service of Azure DevOps. 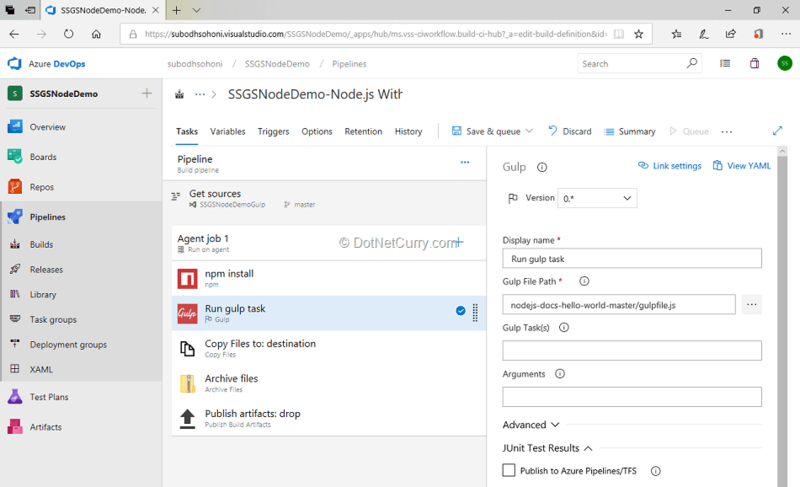 In this walkthrough, we will use Gulp for optimization of code but use Azure DevOps for orchestrating Gulp and other tasks. gulp – This itself is a node module which provides a basic functionality of a task engine. Using this node module, we can create tasks that are required to be executed. In the project, this node module is installed using the npm command “npm install gulp --save". It is referenced using a line of code in gulpfile.js “var gulp = require(‘gulp’);”. gulp-csso – This node module (CSS Optimizer) performs three sorts of transformations: cleaning (removing redundant), compression (replacement for shorter form) and restructuring (merge of declarations, rulesets and so on). As a result, your CSS becomes much smaller. gulp-image – This node module compresses images to reduce their size. gulp-changed – This node module detects if files in a stream have changed. If a file has changed, only then there is a need to run another module on it. Unchanged files are ignored. This reduces the time taken to run the modules. fancy-log – This node module enables logging of the events on the command prompt. The gulp.src function takes all the files matching a pattern in the project for running a module on it. pipe is a construct in Gulp which allows the use of memory stream between two module executions in the same task. gulp.dest is a function which finally writes the output to some destination location in the file form. In the gulpfile.js file, we can create a default task. This contains an array of other tasks defined that we want to run. Remember, Gulp can run either in serial or in parallel, or in a combination of both! When we open the command prompt from the directory which has gulpfile.js, we can run the command “Gulp” which will execute the “default” task which in turn will execute all the other configured tasks. Reviewer Note: After I did npm install gulp –save and then gulp, my console displayed: 'gulp' is not recognized as an internal or external command. After installing gulp globally (npm install -g gulp), it worked. What each task in this Gulp script does is get some files from “Source” folder or its subfolders, process that with the help of some module and then write the output into a “Destination” folder. In case you haven’t read the first article of this series, you can download the readymade app from https://github.com/Azure-Samples/nodejs-docs-hello-world to follow along. To begin this walkthrough, create a folder structure as shown below. Note: So far, we have set up a node server. In case you are new to all of this, it is advised to read more on gulp and node. Observe that we have provided an environment variable named process.env.PORT to the port. This is because we are going to deploy it to Azure App Service as a NodeJS web app and that does not allow any port other than 80 and 443. After creating the folder structure and the index.js file, we can now install all the necessary node modules. Those node modules are listed earlier. Reviewer’s Note: After running npm install, the gulp modules are not installed automatically. Only after we install them manually (to the package.json) with the save-dev parameter, everything works as expected. "test": "mocha --timeout 10000 --reporter mocha-junit-reporter --reporter-options mochaFile=./test/test-result.xml"
Reviewer’s Note: Depending on how experienced you are with these technologies, sometimes it is a good idea to execute the gulp script locally, before running it online. This makes it a lot easier to debug and see what’s going on. We are now ready with the code and can commit/push it to the remote repository on your team project, which we created in the walkthrough during the first article of this series. We will now create a build pipeline which will execute this Gulp script, archive the output and create an artifact that can be handed over to the release management for deployment. Login to your Azure DevOps account and browse to the team project that we had created during the walkthrough of the first article in this series. In the Repos section, you will be able to see the pushed code. Now click the Pipelines – Build tab and then click the New Pipeline button. For creation of this build pipeline, you can use the template of NodeJS with gulp. 2. Run gulp – Select the gulpfile.js which will provide the gulp script to the build engine. This script will create a “destination” folder on the agent and then will create subfolders and files according to the script that we have written. 3. Archive file – This task will create a .ZIP package containing contents of the “destination” folder. 4. Publish Artifact – This will create a “drop” artifact that will contain the contents of the “destination” folder. You will observe that there are a couple of files (.config and .json) that are at the root of the application. We will need to include these files too under the artifact. To do so, add a task of Copy Files before the Archive Files task. Set the root folder of the application as the “source folder” and “destination” as the “target folder”. 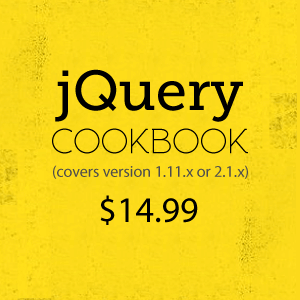 Set *.config and *.json as the contents to copy. As a last setting for the build, open the Triggers tab of the build pipeline designer and enable the “Continuous Integration” trigger. Now we can queue the build which will create the artifact that contains the .ZIP package which can be deployed to Azure App Service. When the build is over, you can observe the “drop” artifact created by the build, which will contain the NodeApp.zip file as was configured. In this walkthrough, we will not be adding any tasks related to mocha tests. They will remain exactly the same. If you want to add a mocha test in the release pipeline, you will need to add a test folder to the “destination” folder so that it will be added to the “drop” artifact and will be available to release management to run the test, similar to what we did in the previous article. Another option is to add the test task which uses “gulp-mocha” node module and run the test as part of the Gulp tasks. I leave that part of the walkthrough at your discretion. 1. 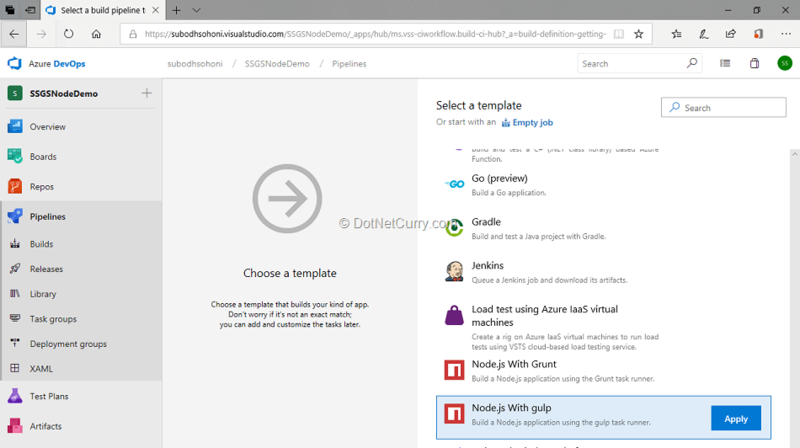 Select the template of “Deploy a Node.JS app to Azure App Service”. 2. Create the Dev Environment, just like in the previous article. 3. As the artifact provider, select the build pipeline that we created earlier in the walkthrough. 7. Package or folder: $(System.DefaultWorkingDirectory)/_SSGSNodeDemoApp-CI/drop/nodeapp.zip. Replace the path of .ZIP file as appropriate in your case. 8. On the rectangle surrounding the Artifact, select the icon that looks like a lightning bolt, for setting the Continuous Deployment trigger. Enable the Continuous Deployment trigger. 9. Save the release pipeline and create a new release. 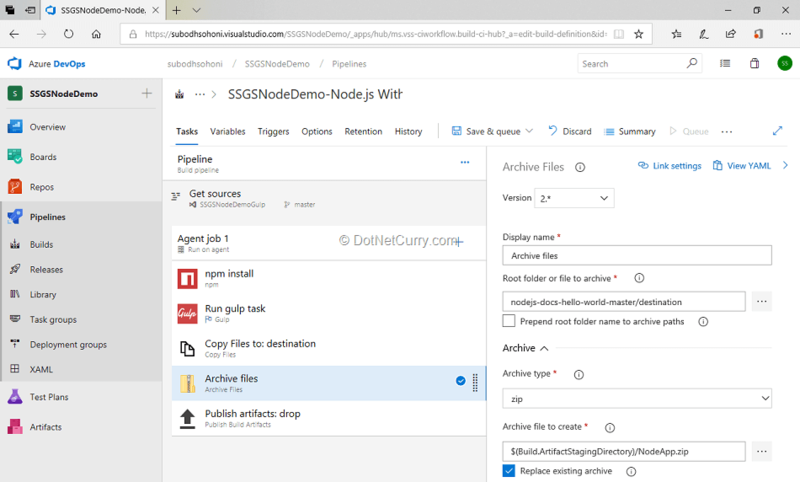 In this article, we walked through using Azure DevOps to perform the build of a NodeJS app and deploy it to Azure App Service as a web app. In this build, we used Gulp for the optimization of code and resources. We also took an overview of Gulp as a task manager. 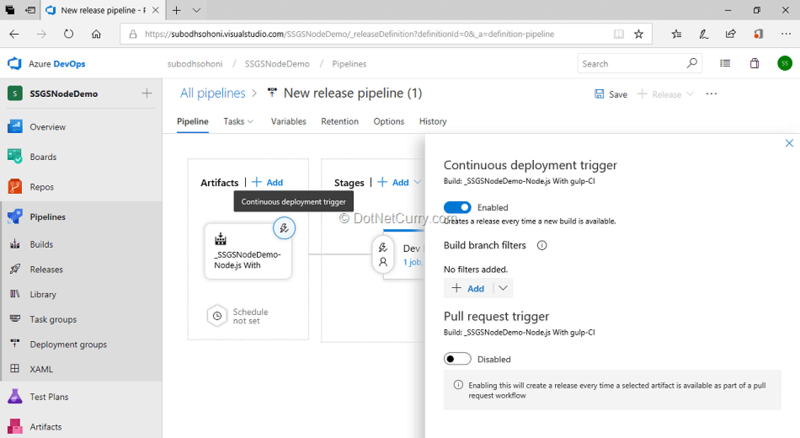 This tutorial demonstrated how to set the Continuous Integration and Continuous Deployment triggers for an automated build and release of an application, using Azure DevOps.